Random House Trade Paperbacks, 9780812976694, 432pp. 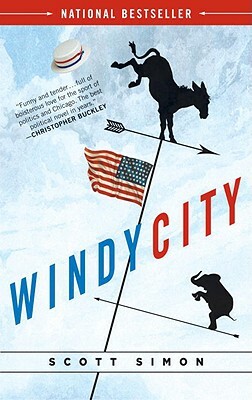 In a novel as brawling and boisterous as Chicago itself, Scott Simon delivers a tale both laugh-out-loud funny and deeply moving, capturing the multiethnic tumult of big city politics. The mayor of Chicago is found in his office late at night, murdered, facedown in a pizza. As police race to find the killer, the interim mayor, Sundaran “Sunny” Roopini, tries to juggle his responsibilities as a recently widowed father of two teenage daughters while herding his forty-nine fellow city aldermen toward choosing a new mayor. Over the course of four days, this raft of colorful characters–heroes, rascals, and pinky-ringed pols of all creeds, colors, and proclivities–will clash, as Sunny, a flawed but decent man, tries to hold together his family and his city. Scott Simon is the host of NPR’s Weekend Edition with Scott Simon. He has reported stories from all fifty states and every continent, and has won every major award in broadcasting. He is the author of the memoir Home and Away, Jackie Robinson and the Integration of Baseball, and the novels Windy City and Pretty Birds. He lives with his wife, Caroline, and their daughters, Elise and Lina.